The beast of the East, Wang Hao is the premiere player from China, one of the top 3 players from Asia, and one of the best players in the world. When he was 16 years old, before he even had a title attached to his name, he won a tournament ahead of 53 Grandmasters and 30 International Masters. He is one of the few players in the world to jump the FIDE Master and International Master titles and go straight to becoming a Grandmaster. Nowadays he is among the top 30 players in the world and is feared at every tournament he plays in. Wang Hao started playing chess at a young age and his first tournament success was when he won the Qingdao Zhongfand Cup in 2002 at the age of 12. In 2003 he gained an incredible 210 rating points in three events, going from 2215 to 2425, jumping him right into notice from the public eye in a short time. 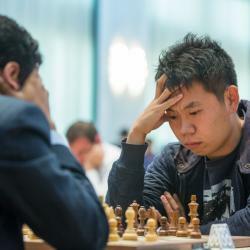 This quick rating jump set the tone for 2005 when Hao burst onto the international chess scene in startling fashion with his biggest success: winning the 7th Dubai Open when he was only 16 years old. He didn’t even have a title at the time and he won the tournament ahead of 53 Grandmasters and 30 International Masters! Next he won the 2005 Malaysian Open and played great in the Aeroflot Open. These three events gained him 3 GM norms and he became a Grandmaster without ever being a FIDE Master or International Master. Now that he has the Grandmaster title, Hao has become the top player in China, one of the top 3 players from Asia and one of the elite players in the world.